We love chicken pot pie, but I have never tried making it myself. If you know me, not only do I love to make everything small and bite sized, I also only make super easy recipes. You truly know that if I successfully pulled off a recipe – you can too! 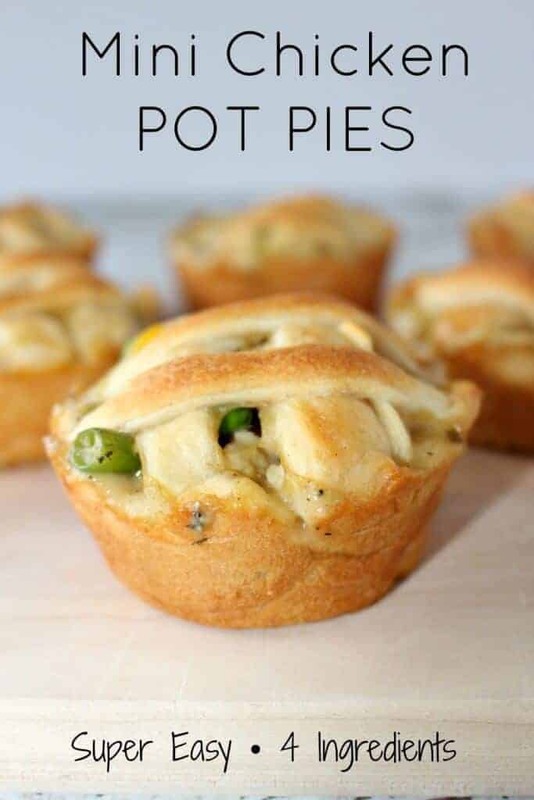 These Mini Chicken Pot Pies, while they are not bite sized, they are cupcake sized – and boy are they good! 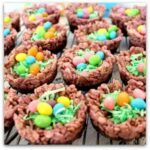 I tried the bite sized version and these just came out better! One thing I can promise you is that they are super easy to make – only four ingredients – it is actually hard to say that I even “cooked” them, technically, I assembled them. These look simple and delicious. Not only would my husband enjoy them, grandson too. In fact the Assisted Living Residents where I work would also, I would just have to adjust the measurements from 12 to almost 36. Is it safe to put them in a lunchbox? My child has lunch 4 1/2 hours after school starts. I would put a freezer pack in there and have them heat it up at school. Anyone have any ideas for another flavor of soup that would work? I live in Europe and we don’t have that particular flavor. You could really use any cream based soup. Looks really simple & good!! Will definitely give this recipe a try. I’m just afraid that the base (inside) is under-baked. Please advise. Thanks! Mine were fine….not undercooked at all. Can you bake ahead of time and freeze for easy meals later? Could I use a pie crust for this? Also can they be frozen to heat up later? I haven’t tried pie crust, but could be yummy! You can freeze and heat up later! Would this work with reduced calorie soup? is there an alternative for the crust that is not so high in carbs? Very cute and looks good; but the recipe is loaded w stuff we shouldn’t eat. I would make chicken soup and use the leftovers, thickened, to make this. The one I found was by the chicken stock, it was in a 14.5 oz small box. The amount of veggies is up to you! At what temperature did you bake them at? I’m making them right now..Thanx for the recipe. .
How much vegetables do I need to get? And what kind? Thanks! You write to”lay the crescent roll flat” are they individual rolls? Or is there a sheet from which I cut the circles? 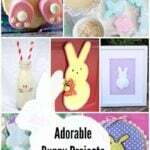 Love your recipes—been stealing your material for quite some time now.I feel somehow unburdened by revealing that! Thank You,Peter. Hey Peter – first of all, thank you for following along on my trying to be a cook and crafter journey! Second, great question… the crescent roll is the “seamless” one long sheet. Then I used a cookie cutter to cut little circles out of the dough. Hope that makes sense??? I can’t find the creamy herb and garlic soup. Can you post a picture of the box please? Really challenging to read the story/recipe with all the pop up ads.